Measuring just 8 square metres, it’s about half as big as a typical school classroom. One student is doing his homework on a table supporting two desktop computers, adjacent to a broken window. Another student strolls in and begins searching for some lost items in a row of old plastic closets on the opposite side of the room. All in all, the room isn’t much different from the other eight rooms at the monastery, each housing four students in a tiny space. Monastery 10 stands to the west of the main entrance to Mahamuntrei pagoda, surrounded by a number of stupas. Oeum Vanna, 25, who hails from Kampong Speu province and hopes to continue his education at university, has been living in the pagoda for more than three years. As he walks out of his room in his student’s uniform, he explains how he came to stay at the pagoda. “My parents asked this pagoda for permission two years before my high-school graduation,” says the first of four children born to a Kampong Speu farming family. Ouem Vanna says that living at a pagoda means one has to adhere to its internal rules, including being out no later than 9pm. That deadline is not flexible, as at that time, the monks lock the gates of the pagoda for the security of the students. Not every student who comes from the provinces gets a chance to stay at a city pagoda. “Only students with good backgrounds who come from impoverished conditions are permitted to stay here,” says Sao Oeun, head of the monastery at Mahamuntrei pagoda. Sao Oeun is responsible for administering the activities in the nine-room building. He explains that every student seeking to live at the pagoda needs to undergo background checks to make sure he has a good academic history, no criminal record, and has displayed exemplary behaviour, as judged by his village chief or school principal. Sao Oeun says he doesn’t want troublemakers at the pagoda, because this would disturb the lives of the rest of the students. In fact, monks from the provinces with hopes of changing their own pagodas in some way have first priority when space is being allocated at the pagoda. All the extra rooms go to students from rural areas. “There are not many rooms for all students who want to be in the Phnom Penh, but at least we can help some of them,” the head of the monastery says. Mahamuntrei pagoda is not the only place students can seek accommodation when transferring to the city to continue their education. Samrong Andet, in Sangkat Phnom Penh Thmey, just outside Phnom Penh, is another pagoda that accepts rural students seeking to better their circumstances. Since 1993, when the pagoda began accepting students, thousands have stayed there free of charge. Two hundred are currently staying at the pagoda. Ra Son, one of the four monks responsible for overseeing the pagoda boys, says the pagoda’s grounds contain 100 rooms in which students can stay, with two students occupying each small room and four in each large room. Even after face-to-face interviews and extensive background checks, not all the miscreants can be weeded out, and some still commit offences while living at the pagoda. “No one can be perfect all the time,” Ra Son says philosophically. Deputy Prime Minister Nhek Bun Chhay (pictured) yesterday defended his leadership of Funcinpec following criticism by his former colleague Prince Norodom Ranariddh, saying he had only strengthened the coalition party. Villagers in Oddar Meanchey province flee fighting along the Thai-Cambodian border in April. Dozens more families living along the border in Oddar Meanchey province fled their homes yesterday as reports of frontline military reinforcements raised the spectre of a repeat of April’s deadly clashes near Ta Moan and Ta Krabey temples, local and military officials said. Uon Ri, chief of Thmar Daun commune, located in Banteay Ampil district, said yesterday that 55 families had now left their homes to seek shelter at the Wat Ku pagoda, about 15 kilometres from the border, as well as the Boeung Trakoun border gate. “We have not been ordered from the top to leave home. They themselves are in fear because they live near the frontline,” he said. Phar Ny, a 31-year-old resident of Thmar Daun village, said yesterday that she feared for the safety of her three children and was gathering her clothes and belongings in preparation for the walk away from the border. “I have to run to find a safe place before the shooting erupts because I have small children,” she said, adding that she was afraid that reported reinforcements of Thai troops signalled preparation for an attack. Phar Ny said other villagers who had not yet decided to flee were remaining at home, keeping away from rice fields and plantations and staying on alert. Pich Sinath, Thamar Daun village chief, said Cambodians were panicking because they believed that an attack by Thailand was imminent. Just 20 out of 76 families in the village remained in their homes, he said. Tens of thousands fled homes on both sides of the border near Ta Moan and Ta Krabey temples during heavy fighting in April and May that left at least 18 dead. Tensions have risen in recent days after Thailand withdrew from the UNESCO World Heritage Committee during a meeting in Paris after it was unable to derail Cambodia’s proposed management plan for the Preah Vihear temple, a longtime source of conflict between the neighbouring kingdoms. Military officials said the border situation remained steady. Meanwhile, Thai Prime Minister Abhisit Vejjajiva said the border conflict would not derail national elections scheduled for July 3, while Thai military officials said there was “no plan” to attack Cambodia, the Bangkok Post reported yesterday. PHNOM PENH, Cambodia (AFP)— A top ex-Khmer Rouge leader on trial for genocide on Thursday vowed to cooperate with Cambodia's UN-backed war crimes court to reveal the truth about the country's "Killing Fields" era. "I personally am not fully knowledgeable about everything, but I will try from the bottom of my heart to make sure that everything is fully revealed," said Khieu Samphan, the former head of state of the brutal regime. "This is the most important moment for me and for my compatriots who are eager to know and understand what happened between 1975 and 1979." Along with "Brother Number Two" Nuon Chea, ex-foreign minister Ieng Sary and his wife, one-time social affairs minister Ieng Thirith, Khieu Samphan faces charges including genocide, war crimes and crimes against humanity. The elderly defendants are the most senior surviving members of a regime whose reign of terror led to the deaths of up to two million people from starvation, overwork or execution. The four deny the accusations against them. As their trial entered its fourth day with a debate about witness and expert lists, the defence complained that the court had failed to admit many of their proposed witnesses. Khieu Samphan, dressed casually and reading a brief prepared statement, urged judges to accept his key witnesses "in order to have a fair trial and so that the truth and my honesty and fairness can be revealed". The 79-year-old also paid his respects to the hundreds of Cambodians, including many monks, who packed the court's public gallery, and acknowledged them with a traditional greeting -- the first suspect to do so. The public face of the Khmer Rouge, Khieu Samphan has never denied the horrors suffered by the Cambodian people. But he claims he was an intellectual and a nationalist and knew little, until long afterwards, of the devastation that was wrought under the regime. The initial hearing is set to conclude on Thursday, with full testimony to follow in the coming months. 'Pretty, rich and smart' woman to be Thailand's first female PM? BANGKOK, Thailand – Less than a week before Sunday’s general election, opinion polls unanimously suggest that Thailand is likely to get the first female prime minister. Only a few months ago she was nowhere near the political limelight. But it’s not that hard to see why Yingluck entered into politics with a bang and is rising quickly to the country’s top job. Her last name is Shinawatra. She shares it with her older brother, Thaksin Shinawatra, the two-time elected prime minister who was ousted in a 2006 military coup, and is now living as a fugitive from Thai justice in Dubai. Thaksin picked his sister over other candidates to lead the Pheu Thai, or “For Thai,” party that he founded originally as Thai Rak Thai. This nepotism, to some people’s disdain, turned out to be a brilliant move on Thaksin’s part. Despite little political experience, the 44-year-old business executive has generated as much buzz as a veteran politician: Yingluck has monopolized covers of major political weekly magazines for weeks. Thousands gathered to wait under the blazing sun to see her on her campaign tour. At another appearance in a northeastern province, a group of a hundred schoolgirls rushed to greet her after her helicopter descended. They squealed as they pushed to get close to her, busily snapping photos from cell phones while holding up one index finger to show support for her party, which is No. 1 on the ballot. Yingluck embodies the “suai, ruai, keng” – a Thai description of “pretty, rich and smart” woman. She looks youthful, confident and at ease. Cameras love to capture her ceaseless smiles. Her clout and celebrity aura match those of her major rival, Abhisit Vejjajiva, prime minister and leader of the ruling Democrat Party. They are equally presentable: under 50, well-educated, and successful in professional and personal life (married with kids), which differentiate them from other candidates. But while Abhisit’s Oxford education, wit, charm and impeccable British-accent English translate well with elites and the Bangkok middle class, these qualities often alienate him from residents of rural parts of the country, who make up the majority of the vote. He may exude confidence and poise at international forums or during interviews, but when mingling with crowds, he’s stiff, appearing uneasy before his constituents. Yingluck, on the other hand, is easier to connect with. Her provincial upbringing and self-made success at her family-run telecommunications and real estate companies make her likeable. Thai people feel that she and her brother understand the hardship and grievances of the poor. Her supporters are aware she’s a political novice. But they also trust that she has an army of top-notched political pundits and economic advisers lurking behind the scene to support her and even coach her public speaking. Yingluck isn’t the first Thaksin’s proxy premier candidate. Thailand had two prime ministers who acted as Thaksin’s proxies, but they didn’t last very long. Cantankerous Samak Sundaravej was forced by court order to resign overa conflict of interest linked to his cooking show on TV. His successor, Somchai Wongsawat, Thaksin’s brother-in-law, had to step down after a constitutional court found his party guilty of electoral fraud. By appointing Yingluck, Thaksin makes it clear that this election is about him. It’s his biggest battle yet against the country’s old power – the military and royal establishment – who tried to uproot him. One of Yingluck’s Facebook profile pictures is that of her wearing a red hijab next to a Muslim woman who snapped their picture from her Blackberry. The picture was taken during her campaign trail in the Islamic south, the Democrat’s political stronghold where Thaksin, leader from the north, could never quite penetrate. The picture bodes well with Pheu Thai’s PR scheme to promote Yingluck as a baggage-free, fresh face leader who can heal the divisive country. But her imminent victory at polls is making the military and the 2006 coup makers jittery. Her Pheu Thai party says it will issue a blanket amnesty for all its allies and rivals charged in relation to the 2006 coup, which could pave the way for Thaksin’s whitewashing and triumphant return. After all, Thaksin is the man the coup makers have put tremendous efforts in different devising to get rid of. Critics fear the military will be tempted to stage another intervention. Thaksin’s return will be a big blow that can change the political landscape and dynamics of power in a significant way. Yingluck tries to ease the fear by saying her first priority is the people’s wellbeing and moving the country forward, not one man’s fate. But so far, she has never clearly stated her political opinions or standpoints. She lets Thaksin handle all the tough talks, in-depth interviews with foreign media from abroad. At home, she chooses to stick to scripts and keep her messages simple. Besides her commitment to continue her brother’s populist policy legacy – i.e. free tablet PCs to a million school children, a wage hike, and low interest loans to villagers – it’s hard to say what kind of leader she will be. Nevertheless, it doesn’t appear to bother her supporters, who remember what it was like when Thaksin ruled. Cambodian vultures: slender billed (l), white-rumped (m), and red-headed vultures (r). 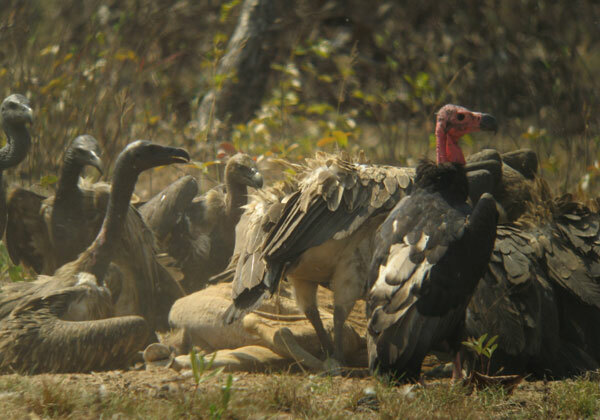 The number of the critically endangered vultures in Cambodia has declined 7.6 percent to 267 in June this year from 289 at this time last year, according to the vulture census released on Thursday. The census was conducted by Cambodia Vulture Conservation Project (CVCP) in cooperation with the ministries of environment and agriculture. Song Chansocheat, the manager of CVCP, said the census had been done simultaneously on June 10 and 20 in seven different jungles in the provinces of Preah Vihear, Stung Treng, Mondolkiri and Rattanakiri, where the vultures are living. The vulture census was held by lying out cattle carcasses for vultures to eat and then the vulture population had been counted. "The census is not 100 percent accurate; however, we can conclude that the number of vultures has been declining in Cambodia," he said. In an effort to save this critically endangered bird in Cambodia, the CVCP has killed a cow in each of the seven places every month in order to feed those vultures, he added. BANGKOK — Fighting broke out on Friday (4th February, 2011) and Saturday (5th February, 2011) between Thai and Cambodian soldiers on a disputed stretch of the border, the latest flare-up in an ancient feud over a 900-year-old Hindu temple. The two sides reached a ceasefire by Saturday (5th May, 2011) afternoon. Below are some facts about the temple, the territorial dispute and possible political ramifications in Thailand. WHAT'S THE HISTORY OF PREAH VIHEAR? Preah Vihear, or Khao Phra Viharn as the Thais call it, was completed in the 11th century and predates Cambodia's more famous Angkor Wat temple complex by 100 years. 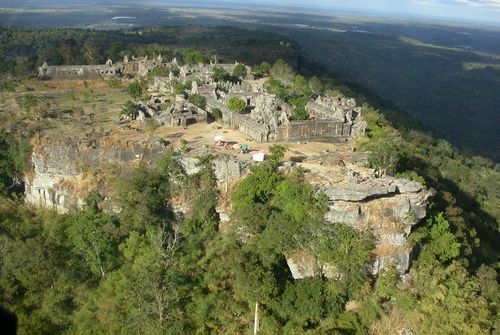 Many say its stunning setting atop a jungle-clad escarpment overlooking northern Cambodia also eclipses its celebrated cousin as the finest of all the ruins left from the mighty Khmer civilisation. The temple has in recent years been accessible mainly from Thailand. Landmines and Khmer Rouge guerrillas kept it off-limits from the Cambodian side for decades. Both sides have historically laid claim to the temple but a 1962 World Court ruling awarded it to Cambodia. Thailand and Cambodia have squabbled ever since over demarcation of the border and jurisdiction over 1.8 square miles (4.6 sq km) of land around Preah Vihear, which was not covered by the ruling. For generations, the temple has stirred nationalist passions on both sides. Before the court in The Hague made its ruling, Thailand's government organized a fundraiser in which every citizen donated 1 baht to pay for the legal team. HAS THERE BEEN VIOLENCE OVER THIS IN THE PAST? Cambodia's bid since March 2008 to list the ruins as a World Heritage Site sparked an exchange of gunfire in October that year in which one Thai and three Cambodian soldiers were killed. There have been sporadic flare-ups since then, the most recent in April last year. Relations with Cambodia have become a bone of contention in long-running hostility between Thai political factions with pro-establishment "yellow shirt" activists accusing their main rival, ousted former populist premier Thaksin Shinawatra, of colluding with Cambodia to Thailand's detriment. The temple dispute has been back in the headlines since the end of last year, when a group of activists allied with the "yellow shirts" was arrested for allegedly encroaching into Cambodian territory. A Cambodian court sentenced two of them on February 1 to jail terms of six and eight years for trespass and spying. "Yellow shirt" protesters demonstrating over the territorial dispute near the Thai prime minister's office since January 25 have threatened to step up their protests as a result, putting pressure on the government to take a tougher line. HOW IS THE DISPUTE BEING RESOLVED? The two countries routinely pledge cooperation over the temple, give guarantees their border troops will not engage in hostilities and agree to delineate the border once and for all, but the quarrelling never seems to stop. Thailand wants joint development and supervision of the Hindu temple, which could one day be a lucrative tourist site. However, the temple debate is often used in both countries as a tool to gain popular support or to distract the public from other issues. PHNOM PENH (Reuters) - Cambodian recruitment agencies have decided not to send maids to Kuwait after complaints by human rights groups of abuse by employers, a recruitment official said on Thursday. Impoverished Cambodia is one of Asia's biggest exporters of maids abroad, a valuable source of foreign exchange. An Bunhak, president of the Association of Cambodian Recruiting Agencies, said Cambodia had not yet sent any maids to Kuwait and the agencies had decided against so doing because of the country's record of abuse. "We have received a report from our embassy in Kuwait about abuse of maids and also the report from Human Rights Watch," An said. "We would only send there when there is safety," he said. "According to studies, the respect for maids has not been good so we will not send them to Kuwait and we are doing studies on another country," he said, referring to Qatar. Human Rights Watch says domestic workers in Kuwait who try to escape abusive employers face criminal charges for "absconding" and are unable to change jobs without their employer's permission. Indonesia, which has come under fire for its use of the death sentence, has barred its citizens from working in Saudi Arabia after an Indonesian maid was beheaded for murdering her Saudi employer. [Tourists visit Bayon Temple in Siem Reap province earlier this month. will baxter]. A YEAR ago, Allison Angkor Hotel was temporarily laying off employees between May and July, Cambodia’s slow tourist season. This year, however, the hotel on National Road 6 in Siem Reap is fully staffed due to a sharp increase in Chinese guests. “During these months, it’s kind of quiet for Western tourists. In 2009 and 2010, we had to make staff take mandatory leave. But because of Chinese tourists this year, we didn’t have to do that,” Allison’s General Manager Kousoum Kina said. With nearly 100,000 Chinese visiting the Kingdom during the first five months of the year, Chinese visitors are increasing rapidly, currently third in total number of tourists behind Vietnam and Korea, according to statistics from the Ministry of Tourism. The 33 percent year-over-year growth in Chinese tourists far outpaces inbound tourists from comparable neighbouring countries. Korean tourist numbers grew by 20 percent in the first five months of the year compared to the year before, while Vietnamese tourists, increased by about 16 percent, according to the statistics. Tourism Minister Thong Khon said he projects the Kingdom will see 200,000 total Chinese visitors in 2011, or year-over-year growth of about 40 percent. However, industry insiders say the economic impact from the growth of Chinese tourists has presently been confined largely to well-connected businesses in Siem Reap. Cambodian insiders say up to 90 percent of Chinese tourists travel in tour groups, visiting only the hotels and restaurants to which their guides take them. For hotels with inroads into the market, the effect can be lucrative. Chinese tour groups are taking up to 40 rooms in the Allison Angkor Hotel per visit this season, Kousoum Kina said. Some hotels with traditionally Western customer bases are finding the Chinese market challenging, Roman Cornillet, sales and marketing manager at the Himawari Hotel in Phnom Penh, said. “It’s kind of difficult to penetrate this market,” he said. The Angkor Riviera Hotel in Siem Reap has seen large increases in Chinese tourists since the end of last year, Assistant Manager Tang Ros Sok said. Fostering good relations with Chinese tour operators has been essential for luring Chinese customers, he said. “If there’s no cooperation with the tour guides, then no Chinese guests will come. They are hard to find,” Tang Ros Sok said. The City River Hotel, located in the same area as the Angkor Riviera Hotel, has seen almost no Chinese guests this year, Manager Paul Sreng said. Guests at the City River Hotel are primarily European and the hotel does not have contacts with Chinese tour operators, he added. With an increasingly affluent middle class in China, experts say Chinese tourism in the region will see dramatic increases during the next two decades. “The potential for growth is huge, vast,” Tim Winter, a senior research fellow at the Centre for Cultural Research at the University of Western Sydney, said. 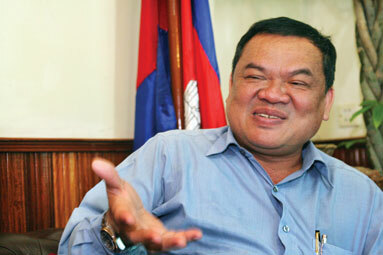 Regional tourism now dominates the Cambodian market, Winter said. While 10 years ago the majority of travellers in the Kingdom were from Europe and North America, 75 percent of today’s inbound tourists are from within the region, he said. More than 230,000 Vietnamese tourists visited Cambodia in the first five months of the year, according to statistics from the Ministry of Tourism. But Vietnamese spend less compared to their Chinese counterparts, said Wei Jiming, manager of the Wood House Chinese Restaurant in Siem Reap. “There are lots of Vietnamese tourists in this city, but they don’t spend like the Chinese do,” he said. Rapid growth in Chinese disposable income is translating into larger bills in Siem Reap restaurants and hotels, Wei Jiming said. China’s per capita GDP was about US $7,400 in 2010, a 10-percent increase over the previous year, according to the International Monetary Fund. Vietnam’s 2010 per capita GDP was US $3,100, with an increase of about six percent. A politically stable Cambodia, coupled with China-oriented promotion accounts for the increasing numbers, Minister Thong Khon said on Tuesday. “We did a good job advertising to Chinese and were successful during our exhibit at the Shanghai World Expo last year,” he said. Charter flights from a growing number of Chinese cities have made Cambodia an easy travel destination, Thong Khon added. Chinese cities such as Chengdu, Beijing, Shanghai, Guangzhou and Nanjing have direct flights to either Phnom Penh or Siem Reap. Cambodia’s burgeoning Chinese tourism market is largely concentrated in Siem Reap. Hotel and restaurant operators in Phnom Penh said they haven’t seen the same increases in Chinese tourists this year. Huang Rujiang, manager of Yi Pin Xiang Sichuanese Restaurant on the capital’s Monivong Boulevard, said he has seen an increase in Chinese businesspeople, but not tourists. “There’s nothing that Chinese want to see in Phnom Penh. That’s all in Siem Reap,” he said. Phnom Penh’s various genocidal museums, such as Tuol Sleng and the Killing Fields, are not appealing to Chinese travellers, Huang Rujiang added. SIEM REAP, Cambodia (AFP)— It has taken half a century, but archaeologists in Cambodia have finally completed the renovation of an ancient Angkor temple described as the world's largest three dimensional puzzle. A senior Cambodian official has denied Thai accusation that the Cambodian military has moblised troops, staged military drills in using had grenades and firing long-range artillery. 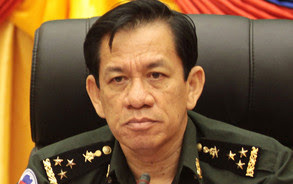 Gen. Chumm Socheat (pictured), spokesman for the Cambodian Defence Ministry, said Cambodian troops are on high alert, but are still stationing quietly in the positions. "Our troops which have been stationed along the border have not been mobilised. We thought that this issue (troop movement) have been purely concocted by Thailand in order to created problems with Cambodia", he said. A few days ago, Thai MCOT News quoted a Thai commander, Col. Prawit Hookaew, as saying that Cambodia is moblising and reinforcing troops to the border areas. In the last few days since Thailand had walked out of a Unesco's World Heritage Convention in Paris in protest against Unesco's decision to submit Cambodia's Preah Vihear Management Plan for consideration, both Cambodia and Thailand had accused each other of reinforcing troops to the border areas in preparations for attacks on the other. Cambodian military has accused Thai troops of conducting military drills along the borders close to Cambodian villagers, forcing Cambodian villagers to panic and fled their homes. 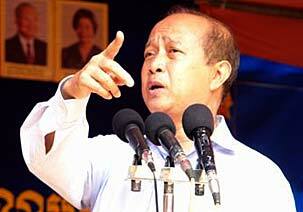 Prince Norodom Ranariddh (pictured) has reignited a long feud with his political nemesis, Gen. Nhiek Bunchhay, by reiterating his accusations that Nhiek Bunchhay had orchestrated his expulsion from the Funcinpec Party in a party coup on 18th October, 2006. Mr. Nhiek Bunnchay had held a press conference yesterday to deny the accusation, saying that the party did not expel the prince, but he had left the party on his own volition. "We have held a meeting many times, not just me, exchanging ideas, especially the Steering Committee, to reform the party which we have reformed three points. First, in order to follow democratic principle, after 18th October 2006, the party president cannot be president for life. Secondly, all decisions cannot be made by a president alone. Thirdly, the most important thing is we want to eliminate corruption in the appointments of officials (in the government)", he said. Mr. Pen Sangha, spokesman for the Norodom Ranariddh Party, said Mr. Nhiek Bunchhay's comment was just to whitewash his betrayal of Prince Ranariddh. "What Mr. Nhiek Bunchhay said in the press conference this morning (29th June), I think that Mr. Nhiek Bunchhay just want to whitewash (his betrayal)", he said. GEORGE TOWN: Leader Universal Holdings Bhd will be able to generate partial revenue from its US$107mil build-operate-own power transmission concession project in Cambodia in the third quarter of this year. Group managing director Datuk Sean H'ng Chun Hsiang told reporters after the company AGM that the first phase of the power transmission project between Kampong Cham and north Phnom Penh was scheduled for completion in July. “We can then start partial billing in the third quarter of this year. The second and third phases will be completed in 2012 and 2013 respectively,” he said. On the expiry of the power purchase agreement for the power plant in Phnom Penh by 2015, H'ng said the completion of both the coal-fired plant in Sihanoukville and the transmission project in 2013 would ensure that the group's revenue and income from its power business would not be disrupted. “We currently have in excess of about RM800mil worth of cable and wire products to deliver to our customers. About one-third of the orders on hand come from Asia, Australasia, Middle East and Europe, while the remaining is from domestic customers,” he said. H'ng said the group would allocate about RM30mil to upgrade its cable production facilities in Kedah and Johor. Families prepare to bolt for shelter. Bon Thawikerd, a 79-year-old resident of Ban Kan Tuan village in Kap Choeng district, was in her family's shophouse packing bags yesterday afternoon in case they had to leave at a moment's notice. Her younger, and stronger family members had been out since the morning in their paddy fields, rushing to plant rice seedlings. Like the other families in this border community, the Thawikerds are preparing for a possible evacuation in case a new wave of border violence flares up. They are worried about a possible renewal of tensions along the border after Thailand's decision to withdraw from Unesco's World Heritage Convention. The government walked out as it feared the body would approve Cambodia's management plan for the Preah Vihear temple. "We're hurrying here because we don't know when they'll fight again," said Waranya Thawikerd, 48, Mrs Bon's daughter-in-law, as she joined five neighbours in planting rice seedlings. If they can finish before the authorities order them into shelters and away from any possible armed skirmishes, the rice can grow on its own in the fields. But in the worst-case scenario, if they cannot finish planting, the remaining rice seedlings will be too old to plant when they eventually return home, meaning less income for the family this year. "Actually, I don't ever want to run away again. Last time it was for 11 days. There was a lot of food [at the shelter] but I was not happy at all because it was not home," Mrs Waranya said. Troops stationed along the 200km long Thai-Cambodian border are prepared to respond promptly to any Cambodian aggression, a military source said yesterday. The soldiers have stepped up security checks at border areas, especially for people who want to enter the area of mostly farmland where fighting erupted previously. The Ta Kwai and Ta Muen Thom temples are now off-limits and heavily guarded by soldiers. In April, a border clash broke out near these two temples in Surin's Phanom Dong Rak district. Soldiers have been telling villagers living in the border areas to prepare for a possible evacuation. Suphap Wilai, a 32-year-old farmer also in Ban Kan Tuan, said her fears from the April clashes and evacuation had yet to subside. "Of course, we are getting ready to move, but it would be best if there isn't any new fighting," Mrs Suphap said. "People here are living in fear. We don't know when they will start shooting or if we will have to hide in bunkers or be evacuated." How the United Nations foots the bill for a state ruled by thugs. Reporting in Cambodia in the late 1990s and early 2000s, I often ended my day at one of the many restaurants or bars in the capital city of Phnom Penh along the slow-moving, chocolaty Mekong River. There, aid workers and journalists gathered to drink Tiger beer over ice and snack on bowls of sliced chicken flavored with slivers of piquant ginger and tiny, powerful chilies. In the run-up to the local elections in 1999, Cambodian human rights groups and opposition parties had been reporting numerous instances of intimidation, from beatings of opposition campaigners to money being handed out to village chiefs to convince people to vote for the ruling party. This type of intimidation had become common in Cambodia during the 1990s: the crime pages of the local newspapers read like horror-movie scripts, with stories of villagers beating to death petty thieves whom they’d caught, or people handling disputes by taking an ax to the other person. All of the aid workers, many of whom had lived in Cambodia since the beginning of the massive United Nations assistance program in the early 1990s, had heard about the intimidation; some had traveled to villages and seen the effects in person. Only two years earlier, in 1997, a group of Americans working for the International Republican Institute, a democracy-promoting NGO, had attended a rally of the opposition Sam Rainsy Party, along with around 200 party supporters. In what seemed to be a well-planned attack, someone tossed four grenades into the crowd, killing at least sixteen people, maiming at least 100, and leaving limbs and other body parts scattered around on the street. The leader of the IRI mission in Cambodia was seriously wounded in the attack. I nodded my head—of course, after one of the most genocidal regimes in history, elections where people campaigning are only sometimes beaten up or killed were a step forward. But how long should the country be measured against that low standard? And how would any free elections be preserved if Cambodia’s political culture became more and more violent and repressive? By the time I could ask those questions, most of my dining companions had moved on, returning to stories of a European official’s torrid affair with the wife of a friend. Ten years after that evening, Cambodia—back then the site of the largest and most far-reaching UN reconstruction program ever—has not made much more progress. Cambodians have fallen into what democracy experts like Larry Diamond call “the fallacy of electoralism”—they have focused almost exclusively on holding elections as a sign of progress, all but ignoring the other, more important foundations of a free society. In that vacuum, Cambodia’s long-ruling, ironfisted prime minister, Hun Sen, and his cronies, have robbed the country blind, selling off much of its valuable land to China and using unfair laws and outright intimidation to crush any opposition. In his new book, Cambodia’s Curse: The Modern History of a Troubled Land, veteran journalist Joel Brinkley chronicles the travails of modern-day Cambodia and the unprecedented UN effort to get the nation back on its feet. Brinkley was a cub reporter for the Louisville Courier-Journal in 1979 when he visited the devastated country shortly after the genocidal Khmer Rouge fled Phnom Penh. During their four years in power, the Khmer Rouge killed as many as two million Cambodians, out of a total population of just under eight million—proportionally the worst genocide of the twentieth century. They wiped out the country’s entire industrial and commercial base in their attempt to create an agrarian society that they believed would become a communist utopia. During the 1980s, fighting persisted, a civil war between a Vietnamese-installed government in Phnom Penh and a coalition of rebels, including the remnants of the Khmer Rouge. (In a particularly low point in American foreign policy, the U.S. supported the rebel alliance, which included the Khmer Rouge, as a way to fight back against enemy Vietnam, which controlled the government in Phnom Penh.) But in 1991, with the Cold War over, a peace deal inked in Paris brought an end to the Cambodian civil war and offered a promise of freedom and peace for its people. After the truce, the UN, invigorated by post-Cold War unity, embarked upon its grandest mission. Thousands of UN advisers, aid officials, and peacekeeping troops descended on Cambodia. Over the next decade, the UN would spend more than $3 billion on Cambodia’s reconstruction. Even after the UN formally ended its assistance in the late 1990s, Western donors like the United States, Australia, France, and Japan would continue subsidizing much of the country’s budget, to the tune of hundreds of millions of dollars per year. Western advisers helped set up new media outlets, human rights groups, and political parties, demined roads and rebuilt water systems, wrote textbooks and other school curricula, and helped set up new phone, Internet, and other communications systems. A decade after the UN formally withdrew from Cambodia, Brinkley, who by then had moved to the New York Times and then to Stanford University, arrived in the country again, with a mission of assessing the results. Unlike many writers, he took the time to travel the whole country, leaving built-up Phnom Penh, where most Westerners stay, for the remotest and poorest regions of Cambodia. He demanded, and often got, sit-downs with the country’s most powerful leaders, and frequently obtained insightful, revealing answers from them about how badly Cambodia today has failed. And failed it has. For a visitor who stops only in Phnom Penh or Siam Reap, the tourist town near the gargantuan ruins of the twelfth-century Angkor Wat temples, Cambodia might seem like a prospering developing nation. Espresso bars and French hotels have popped up, and Cambodians with money can move into high-end serviced apartments fronting the Mekong. In recent years, growth rates often have topped 6 percent annually. But this sheen of development conceals a much harsher reality. Nearly all the wealth has gone to a tiny circle of elites around the prime minister, while, as Brinkley shows, the rest of the country suffers from poverty and hunger. The per capita income is one-third that of North Korea, and half the population goes to school for fewer than three years. Malnutrition rates are rising even as they fall nearly everywhere else in Asia, and most hospitals are nothing but disease-ridden shacks where patients come to lie down and die. The country’s politics, too, are miserable. The opposition parties that existed in the 1990s have crumbled in the face of persistent pressure from Prime Minister Hun Sen’s Cambodian People’s Party, which now dominates the legislature as a one-party giant. Grenade attacks, shootings, and beatings of opposition activists are common, and the vibrant civil society that emerged in the early 1990s is dying, with union leaders and NGO heads fleeing into exile. Other opposition politicians are simply bought off. Brinkley describes a common stratagem in which opposition politicians who agree to throw in their lot with the ruling party are given control of parts of certain ministries, which allows them to loot public coffers to help themselves and their families. Meanwhile, politically powerful men and women can act with total impunity— they can grab land, steal from the public treasury, or even kill peasants, without repercussions. The tribunal designed to try former Khmer Rouge leaders has focused on only a handful of the top cadres, leaving hundreds of ex-Khmer Rouge to wander free across the country. In the kind of incident that is all too common, a nephew of the prime minister ran down a man on a motorcycle with his Escalade SUV, tearing off the other man’s arm and leg and leaving him bleeding to death in the middle of a crowded street in the capital. As the motorcycle driver died, Hun Sen’s nephew was greeted by military police, who comforted him—and then took the license plates off of his car, making it harder for anyone to report the crime. How did such a massive, and in many ways idealistic, UN operation fail so miserably? Brinkley too often resorts to cultural essentialism, blaming what he sees as traits inherent in Cambodian psychology and culture for the country’s problems. He claims that Buddhism has made Cambodians passive, willing to accept tyrants since the time of the Angkor Empire a millennium ago. There have in fact been multiple uprisings against oppressive rulers in Cambodia, including against the former French colonists and the Vietnamese occupation in the 1980s. I have personally seen any number of passionate demonstrations in Phnom Penh and other parts of the country, protesting, among other things, illegal land grabs, discrimination against HIV sufferers, and political graft. Brinkley argues that Cambodian customs basically have not changed since the autocratic Angkorian era, ignoring the fact that the country’s urban areas today are wired, its opposition activists have deep relationships with other Asian nations, and its years of war and foreign occupation greatly changed traditional customs and mind-sets. In fact, the real explanation for Cambodia’s misery can be found in the decisions made by the country’s top leaders, and UN complicity in them. Cambodian rulers used the power of the state primarily to enrich a few elites and their allies. The UN, for its part, was mostly focused on holding elections, the most visible way to claim success. Inspired by the belief that they would finally have a chance to determine their own destiny, in 1993 Cambodians turned out in overwhelming numbers for a national election, which was won by the royalist party of Prince Norodom Ranariddh. But Hun Sen, who in the 1980s had served as prime minister in the Vietnamese-installed government, refused to concede the election, and threatened a return to civil war. In an unconscionable decision, the international community went along with the installment of Hun Sen as co-prime minister. From that point on, Brinkley notes, Cambodians lost the trust that their votes would really matter. Meanwhile, Cambodia’s political leaders have morphed into a kind of elected autocracy, an increasingly common situation in the developing world. For Hun Sen, and even for opposition leaders like Ranariddh, all of whom grew up in the winner-take-all climate of civil war-era Cambodia, politics have remained a zero-sum game. The concept of a loyal opposition does not exist. And Hun Sen, by far the savviest and most ruthless of the country’s politicians, has played this game the hardest. After 1993, he built up his personal bodyguard corps, whom he could deploy during campaigns to harass or kill opposition politicians. He also recruited the country’s most prominent businesspeople to his side, giving them access to the government, control of valuable natural resources, and ceremonial titles as they allegedly kicked back money to him and his family. (The prime minister now lives in a lavish estate on the outskirts of Phnom Penh, despite making a modest official salary.) He eventually even bought off his biggest rival, Ranariddh, by giving him control of enough ministries to ensure that the opposition leader could himself become fabulously wealthy. As Hun Sen consolidated his power (this year, he will celebrate some twenty-six years in control), Western donors began to accept that they would have to work with him. Until recently, these donors provided the bulk of Cambodia’s budget, but they never used their leverage to demand real reform. For more than a decade, for example, Cambodia’s parliament has promised donors such as the U.S., France, and Japan that it would enact a tough anticorruption law. But for years, the parliament has held up the bill, citing one ridiculous excuse after another. Nonetheless, each year the donors pledge more large sums after hearing promises that this will be the year the anticorruption bill will finally pass. One of the most devastating sections of Brinkley’s book is about this Western toleration of Hun Sen’s thuggery. Compared to many other major aid recipients, Cambodia is a pretty cushy place for foreigners to work. With its legacy of French colonialism, quick air links to Bangkok, new French bars and restaurants, and beautiful homes—all at discount prices—Phnom Penh is a very attractive place to live. Despite the crime and poverty that afflicts Cambodian society, foreigners are rarely attacked. Aid workers who live in Cambodia thus seem to have no incentive to push their bosses to withhold assistance. “For a lot of these aid workers, they are happy in Phnom Penh—it’s really a pretty nice place for them to live. So they don’t want to cut off aid,” says Brinkley. Though Brinkley only touches on this point at the end of his book, developing nations like Cambodia now have new models of development that mix successful capitalism with undemocratic rule. They can copy the example of China—and, to a lesser extent, Vietnam or the United Arab Emirates—and delink prosperous free-market capitalism from democratization. It is noteworthy that China has, in recent years, become far more powerful in Cambodia, surpassing the influence of the Western nations. It is now the largest donor and investor in the country, and Chinese companies have been buying up large swaths of land for a kind of plantation agriculture, often in collaboration with Cambodian tycoons who are close to Hun Sen. Cambodian peasants living on the land are unceremoniously kicked off, with minimal compensation. Chinese schools have proliferated across Phnom Penh, and China has begun training Cambodian military officers—one reason why the Pentagon, despite its concerns about Cambodia’s atrocious human rights record, has been upgrading its defense ties with the country. Two decades ago, Hun Sen castigated the People’s Republic of China as an enemy of Cambodia for backing the murderous Khmer Rouge. Today, he lavishes praise on his Chinese counterparts, clearly understanding that China provides him leverage over Western donors. China is “a long-lasting close friend,” Hun Sen declared earlier this year as he presided over the opening of a rural bridge financed by the People’s Republic. China, of course, says little about Hun Sen’s tough approach to politics while his government has complied with China’s demands: when a group of Uighur refugees, the embattled ethnic minority from western China, arrived in Cambodia in late 2009, seeking sanctuary from China’s oppression, the Cambodian government promptly deported them back to China, over the objections of UN agencies. In the concluding section of his book, after hundreds of pages of examples of the Cambodian leadership’s failure to address the problems of poverty, environmental destruction, and political thuggishness, Brinkley offers a thin gruel of hope. As Cambodia begins to open up to the world, he says, a Cambodian middle class, more forceful and demanding than their parents and grandparents, eventually will push harder for real change, finally leading the country to throw off the yoke of tyranny. I am not that optimistic. Hun Sen is only sixty years old, and easily could stay in office for another decade or more. He faces no real opposition now, and whatever global ferment has been created by the uprisings this spring in the Arab world, it has not resonated in Cambodia. Meanwhile, the major Western donors seem totally unwilling to cut off aid in order to push for democratic governance. And as China becomes more powerful, and the U.S., Japan, and other democratic donors slash their foreign aid, Beijing will only gain more leverage over Cambodia, making it even less likely that any outside forces will push for real democratic change. Reversing years of criticism of Hun Sen, Washington has increasingly built ties with his government, worried about losing out to China for strategic influence in the region. Despite all the country’s problems, at the most recent donor-pledging conference on Cambodia, last June, Western democracies gave the country $1.1 billion, a record amount. And so, ruined by both its own rulers and its overindulgent “friends,” Cambodia’s curse continues. BANGKOK, 29 June 2011 – Thailand will return to the World Heritage Convention if the unilateral management plan for Preah Vihear Temple proposed by Cambodia is postponed indefinitely, according to Secretary to the Foreign Minister Chavanond Intarakomalyasut (pictured). The comment followed a suggestion by Mr Panitan Wattanayagorn, Deputy Secretary General to the Prime Minister and Acting spokesperson for the government, that Thailand's return could be considered if ‘interesting’ proposals were made. Mr Chavanond elaborated that those interesting conditions include a definite postponement of the consideration in the Cambodian management plan and the assurance that demarcation of the overlapping area around Preah Vihear Temple must be completed first. The Foreign Minister’s secretary also brushed aside a rumour of conflict between his ministry and the Ministry of Natural Resources and Environment during the meeting of the World Heritage Committee in France. Earlier, Mr Noppadol Pattama, an ex-foreign minister and legal advisor to ex-Prime Minister Thaksin Shinawatra, criticised the government for withdrawing Thailand from the World Heritage Convention and called for a review of the issue. In response, Mr Chavanond asked Mr Noppadol to review his role in the past that had led to the problem of Thai-Cambodian conflicts which, he said, resulted from Mr Noppadol’s endorsement of a joint declaration supporting Cambodia’s unilateral registration of Preah Vihear Temple as a world heritage site on 18 June 2008. Thailand's decision to quit the World Heritage Convention will have far-reaching implications, notably for its relations with Cambodia. Natural Resources and Environment Minister Suwit Khunkitti announced the intention to withdraw from the convention last Saturday, at a meeting of the World Heritage Committee in Paris. He said Thailand was withdrawing because the committee's consideration of Cambodia's plan could threaten Thai sovereignty and territory. Without the Thai action, said Mr Suwit, Cambodia could use the forum to support its case in the World Court against Thailand, over the dispute over 4.6sqkm land around the temple. The World Court handed the 11th century Hindu temple to Cambodia in 1962. Nonetheless, we think the withdrawal from the WHC may have some unforeseen consequences, and the Abhisit government must be held responsible for what may happen. We are particularly concerned that Mr Suwit's action could increase tensions at the Thai-Cambodian border, where at least 20 people have died in armed clashes in the area surrounding the temple since 2008. The government must handle this issue with the utmost discretion. The dispute should not be used by any party to gain political or electoral advantage, as its consequences may be too grave for our country. With only three days to go before the Thai general election this Sunday, the different political factions have brought out what could be seen as their final strategy to woo voters. The two leading political parties, the ruling Democrat Party and the Puea Thai Party, will host their last election rallies tomorrow in Bangkok. It will be their last chance to wrap up their campaigns and, perhaps, to attack their opponents, while scoring political points. Two key developments during the past few days may have benefited different political factions in the run-up to the polls. First, the re-emergence of the Preah Vihear Temple issue could be used to boost support for the Democrats. Last Saturday, Thailand declared that it would withdraw from the World Heritage Convention after a disappointing decision by its secretariat to advance Cambodia's management plan for the temple. Natural Resources and Environment Minister Suwit Khunkitti, who is leading the Thai delegation at the United Nations Educational, Scientific and Cultural Organization meeting in Paris, said the organisation had ignored Thailand's pleas. Withdrawal from the body is now inevitable. He said: "The World Heritage Centre decided to put the matter on the agenda. I have no choice, we have to withdraw. The decision is to prevent the other side from using this issue to claim our territory." Preah Vihear has served, for some time now, as a political tool for Thai political actors to gain some political advantage at the expense of worsening Thai-Cambodian relations. Cambodia has insisted on proposing its own development plan in the area surrounding the temple. Thailand, however, has alleged that Cambodia's plan is a breach of Thai sovereignty. While the temple legally belongs to Cambodia according to the verdict of the International Court of Justice in 1962, the two countries have claimed the ownership of the 4.6 sq km area adjacent to the temple. Supporters of the Democrat Party have been quick to applaud Mr Suwit's decision. A sense of nationalism has been revived, exactly during this critical time before the elections. Prime Minister Abhisit Vejjajiva did not object to the decision but has instructed government agencies to study and report on the legal implications for Thailand and the steps which need to be taken by the next government after Sunday's elections. A Bangkok resident, who has supported the Democrat Party, said: "The government did the right thing. We could lose our sovereignty to our enemy. I would like to vote for the Democrat Party for its patriotic stance." In another development, the release of a controversial report by a former reporter with Reuters news agency, Mr Andrew Marshall, on the role of the Thai monarchy in politics and the political development in Thailand, is likely to tarnish the image of the Democrat government. The report also highlights the elite's unfair treatment of the Red Shirt movement, which is closely associated with the Puea Thai Party, and explains how the monarchy has come to play an immense role in the political domain. This role has been underpinned by a variety of measures adopted by its backers, especially those in the army. Mr Marshall also discusses the crisis within the palace, the political intervention of the military, and the Abhisit government's crackdown on the demonstrators in May last year. Mr Marshall's message is clear: The Democrat Party represents only the interests of the elite, not those of the people. Undoubtedly, his report will have an impact on the Thais as they head to the polls this Sunday. Pavin Chachavalpongpun is a fellow at the Institute of Southeast Asian Studies. Four soldiers have been arrested in a crucial northeastern Thailand political battleground for allegedly intimidating opposition activists ahead of elections at the weekend, police said on Wednesday. The commander-in-chief of the military, General Prayut Chan-O-Cha, has pledged to be neutral in Sunday's election but has also called for the electorate to cast votes for “good people”. His comments were taken as an attack on Yingluck Shinawatra, sister of the now-fugitive former leader Thaksin Shinawatra who is the main opposition candidate for Prime Minister and likely to win the election, according to polls. The government has brushed off a challenge by Cambodia that it formally withdraw from the World Heritage Committee, while denying it was playing up the issue for political gain. Prime Minister Abhisit Vejjajiva (pictured) yesterday said Cambodia should stop interfering in Thai affairs, after its leader Hun Sen stepped into the debate over the government's decision to leave the WHC. Hun Sen has challenged the government to officially inform the United Nations Education, Scientific and Cultural Organisation (Unesco) if it was serious about withdrawing. "If you have the heart of a son, you will write a formal letter to the WHC," he told a graduation ceremony in Phnom Penh. Political commentators have criticised the government for showboating over the issue to attract the support of voters allied to the People's Alliance for Democracy, who have campaigned for the government to withdraw from the WHC to safeguard Thai territory in the disputed border area. Natural Resources and Environment Minister Suwit Khunkitti, who walked out of a WHC meeting in Paris last week, has been forced to defend his decision amid claims that it discredits the country internationally. Mr Abhisit said Thailand's decision did not concern Hun Sen, and he should not interfere in the government's work. He said the government would discuss with Unesco the effects of the WHC's decision not to consider Cambodia's management plan for Preah Vihear temple. The matter concerned Thailand and Unesco only, Mr Abhisit said. He insisted the government's decision to withdraw from the WHC was meant to protect Thai territory, and not done merely for domestic political advantage. Thailand has yet to formally withdraw from the body, despite Mr Suwit's assertion from Paris last week that his withdrawal took immediate effect. The government had campaigned against the WHC discussing Cambodia's management plan for the disputed Preah Vihear temple, and threatened to withdraw if the plan was put on the agenda. Sources say the meeting was drafting a statement confirming that discussion of the plan would be postponed, which was in line with a decision reached at an earlier WHC meeting in May. However, the Thai delegation took exception to the wording of the draft, so Mr Suwit walked out. Campaigning in Samut Sakhon yesterday, Mr Abhisit, who is also Democrat Party leader, said the public should decide whether to vote for the party that was "really" protecting the national interest in a way that might upset the leader of a neighbouring country, or back the local party that was close to Hun Sen. He was referring to Pheu Thai Party, whose de facto leader, Thaksin Shinawatra, worked as a consultant to Hun Sen's government in 2009. Mr Abhisit said he did not believe Thais wanted to risk losing border territory, and that his government had succeeded in foiling the World Heritage Committee's consideration of the management plan. He said if Cambodia sincerely wanted to solve bilateral problems, it should stop complaining to the international community about their border dispute, and resume bilateral negotiations with Thailand. Cambodian complaints in international forums would only compound bilateral tension, Mr Abhisit said. Meanwhile, Mr Abhisit denied a rumour in Cambodia that Thailand would attack Cambodia as a ruse to postpone Sunday's election. Reports suggest Cambodia is reinforcing its military near the border. Mr Abhisit said that while the Thai army had yet to reinforce its own troops, soldiers stood ready to defend the country. First Army commander Lt Gen Udomdet Seetabut, said Cambodia had fielded infantry companies at two important locations opposite Sa Kaeo province. While movements on the Cambodian side did not yet justify any concerns, he had ordered troops to strictly screen immigrants and their vehicles entering the country from Cambodia. In Surin province, Lt Gen Tawatchai Samutsakhon, commander of the 2nd Army, said Cambodia was replacing soldiers along the border, and the risk of a clash could not be ruled out. Visits to the Ta Muen Thom temple in Phanom Dong Rak district had been suspended for safety reasons. Cambodian soldiers visited the temple to monitor the movements of Thai soldiers. Thai soldiers told their Cambodian counterparts to disarm before entering the temple. Border trade continued and gamblers still crossed the border to casinos in Cambodia through the Chong Jom border pass in Surin as usual. Foreign Minister Kasit Piromya said Thailand's withdrawal from the World Heritage Convention complied with a cabinet resolution which required action in case of developments which might affect sovereignty. 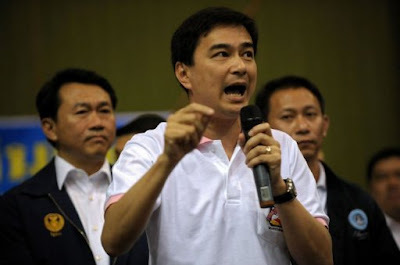 Mr Abhisit said on Tuesday that the next government should decide Thailand's fate with the WHC. Abhisit on the campaign trail. The dispute between Thailand and Cambodia over Preah Vihear Temple is spreading into wider political arenas as Prime Minister Abhisit Vejjajiva shifts blame on the Pheu Thai Party and its de-facto leader Thaksin Shinawatra, as well as Cambodian premier Hun Sen, who has personal relations with Thaksin. Democrat leader Abhisit said yesterday that Hun Sen wanted Thai voters to change the government and end the dispute with Cambodia because the Cambodian leader has good ties with Thaksin. "But I want the voters to choose the Democrats as we protect the territory, although it is against the wishes of a leader in a neighbouring country," Abhisit told reporters while campaigning in Samut Sakhon. Abhisit earlier blamed Thaksin's associates, including former foreign minister Noppadon Pattama and the opposition Pheu Thai Party, for his failure to block Cambodia's ambitions to restore and repair the Preah Vihear Temple. He said Thaksin's group has close relations with Cambodia and supports its plan for the temple. The war of words through the media has gone international after Thailand and Cambodia crossed swords over the temple's inscription at the 35th session of the World Heritage Committee in Paris last week. Cambodian premier Hun Sen reportedly accused Thailand of using the dispute for domestic political gains. The Thai military yesterday dismissed reports of planning to launch an attack on neighbouring Cambodia, using the border conflict at the Preah Vihear Temple as a pretext, to jeopardise the July 3 election. Army chief Prayut Chan-ocha has issued a clear policy instruction not to invade other countries, said First Army Region Commander Lt-General Udomdej Sitabutr. "We will retaliate only when attacked." Local media has reported over the past days that the border is highly tense after Thailand announced its withdrawal from |the World Heritage Convention. Military officials and politicians contesting the election were speculating on the threat of a military clash along the border with Cambodia, alarming residents along border areas. Udomdej said the Cambodian military has moved some infantry units closer to Sa Kaew, but there has been no report of a large reinforcement of armoured vehicles and heavy weapons. However, the commander who visited the border province yesterday ordered Thai troops to step up security measures, including a strict check on people and vehicles at border checkpoints and is seeking negotiations with Cambodian counterparts to ease problems. "There is plenty of rumour in both countries now, but we are very careful to prevent such talk from affecting our relations with a neighbouring country," Commander Udomdej said. "Now relations are normal and we are engaging with our Cambodian counterparts at all levels," he said. Abhisit Vejjajiva said his caretaker government would not exploit the conflict with Cambodia as an excuse to delay the election. "We have proved before the international community several times that we did not trigger the military conflict and we do not have a policy to encroach into any country," Abhisit said. As Thailand walked out of the session after failing in the diplomatic struggle to block Cambodia's move to restore the temple, the focus moved more to the military front. On Monday, the Thai Second Army Region's spokesman Colonel Prawit Hookaew said that there was some redeployment and reinforcement of Cambodian troops along the border in reaction to the outcome in Paris. However, Cambodia's Defence Ministry on Tuesday rejected the report of any movement of troops and weapons, China's Xinhua news agency reported. "The Royal Cambodian Armed Forces absolutely rejects this fabrication by Thai troops to slander Cambodia and to prepare a scenario to confuse and lie to national and international communities," the ministry said in a statement. "This fabricated information by Thai troops is just a groundless argument, aimed at future attacks and invasion of Cambodian territory," it added. However, Col Prawit yesterday softened his tone saying there was only a minor rotation of Cambodian troops near Si Sa Ket province, and there was no significant shift of power in the border area. "[But] we are ready and standing by in our stations," he said. "If anything happens, we will definitely be able to protect our border."